Who is the Best Satellite TV Service Provider in 2019? 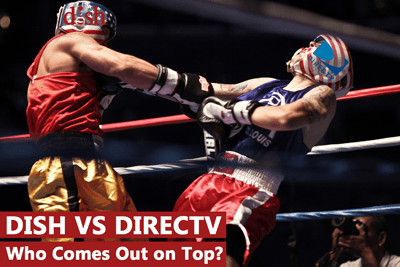 The two best satellite TV providers in 2019 are DISH and DIRECTV. Both companies offer customers similar programming that feature an extensive array of TV channels, live sports and even On-demand services. DISH Satellite TV packages start at $37.99 and DIRECTV Packages start at $50. For a side-by-side comparison of satellite TV providers visit DISH vs DIRECTV. A major benefit of satellite TV service is its availability. Satellite technology does not rely on cable infrastructure to reliably transmit television service, and can truly broadcast anywhere. Cable TV companies are generally not able to cater to rural or remote customers, while Satellite companies can accommodate any customer with a clear view of the southern sky. Nobody wants to overpay on satellite television. Compare DISH and DIRECTV, then make the switch to the low-cost leader in digital programming. Tip: For the best TV packages at the lowest cost, choose the satellite provider with a reputation for quality and reliability. Q. What is the Cheapest Satellite TV Service? A. DISH TV offers the least expensive satellite TV package, the Flex Pack, which starts at $37.99 per month and includes 50+ channels and an add-on channel pack of your choice. DIRECTV’s least expensive package is $50 per month. Q. What is the best satellite TV deal? A. The Satellite TV plan with the most channels for the lowest monthly payment is the America’s Top 250 plan from DISH. Subscribers get more than 290 channels for just $74.99 per month with a 2-year contract. DIRECTV offers 240 channels for $75. The satellite TV provider with the best value is DISH. Q. How can I save more money with Satellite TV? A. All satellite TV providers allow customers to bundle Satellite TV service and internet for additional savings. Customers who take advantage of TV and Internet bundles save an average of $10 per month. Additionally, customers who bundle Satellite TV service with and internet plan enjoy the convenience of dealing with a single bill for their services. Q. Is satellite TV reliable? A. Satellite TV is reliable, even in in-climate weather. The nations top Satellite TV providers have 99% signal reliability, which has improved consistently over the years. Q. How does satellite TV work? A. Satellite TV providers use a communications satellite, orbiting earth, to broadcast television programming, which can be picked up by a small receiver dish attached to a home or business. The best of the leading satellite TV providers in the US are DISH and DIRECTV. In our analysis of the providers programming packages, channels, DVR and promotional offers, DISH was the clear winner. DISH is the best Satellite TV Provider.